Everything You Need for a family, pet friendly or romantic Stay At The Beach. Grandma's House is 2 Bedrooms, including a queen in one room and a queen and twin in the other. We just installed a 2-3 person hot tub with a privacy fence. The large yard is fenced in and friendly for kids and pets. There is a firepit with wood provided. The roomy bright kitchen has everything you need to prepare your own meals. There is a washer and dryer and a full bathroom. The house is centrally located a short drive to the beach and the docks. Basic Dish and Wi-fi are included. We have provided bikes, an umbrella stroller, kites, toys, including sand toys and games for the kids as well as books and movies. We are Shawn and Rene Tobin. We live in Gold Bar Washington on the way to Stevens Pass. We have 4 kids and 3 dogs as well as one Grandma living with us. Needless to say hotels are not the place for us! We love vacation houses and stay in them when we travel. We started out buying our first house in Westport when we adopted our 2 youngest children 8 years ago. We needed a place to stay when we came to visit grandmas Glenna and Beth. Our family just did not fit in a hotel room anymore. We decided to rent the house out when we were not using it to make ends meet. We found a property manager to rent it for us but they went out of business. Rene decided to manage the house herself and discovered she really enjoyed the job. We love sharing Westport with others and helping people make vacation memories so when the opportunity to buy Shawn's great uncle Ed's house came up we bought that too. Then Shawn's mom Glenna moved in with us leaving her parents home empty, and so now you can enjoy Grandma's house too. This house is owned by the Tobin Family. Shawn Tobin grew up living with his Grandparents Earl and Elizabeth Brown in this house. Years ago we made a deal to buy Grandma's house from her while she lived in it. Shawn wanted the house to stay in the family and he wanted to help his grandma out with a little extra bingo money. Earl was a commercial fisherman with his brother Ed and Elizabeth worked in the canneries. Shawn's mom Glenna worked in the hospitality industry and his sister Mickie worked at the shipyard. Other family owned and worked Cranberry Bogs. Shawn spent his childhood riding his bike around Westport playing in the woods and at the beach and developed a love of nature that led him to work for parks. Rene grew up in the suburbs of Seattle. Her parents loved the beach and family vacations seemed to always led to the coast. Grandma's house has 2 bedrooms with beds set up to accommodate one or two couples or a family with kids. The house is very pet friendly with a fenced yard. Everything you need for comfort and convenience is provided. Meals are easy in the well stocked kitchen, there is a full bath and washer and dryer. We have provided bikes and helmets for just about everyone and a firepit with wood too. And last but not least there is a private hot tub. This house is close to the Westport Light House and a popular beach approach. It is a few blocks to the beach. We usually have 4 adult bikes and an assortment of kids bikes. If you have specific needs please let me know a few days before your stay. 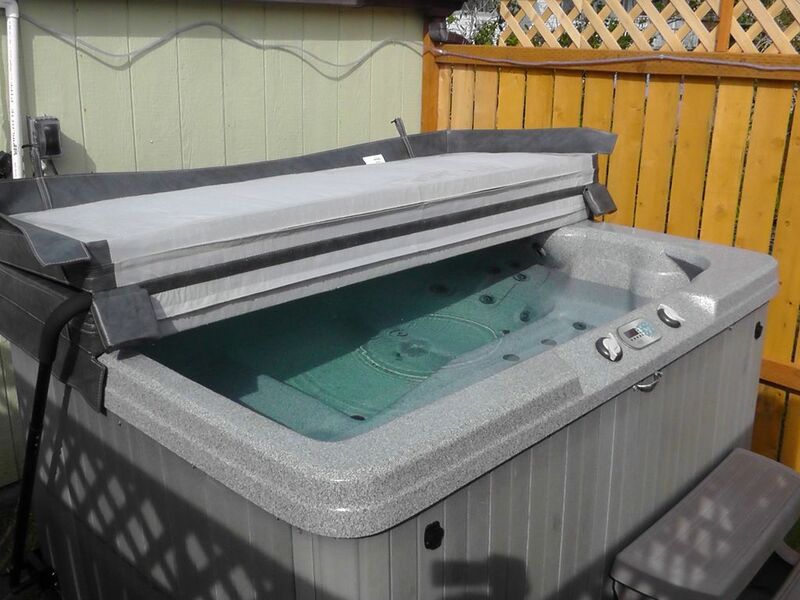 the hot tub fits 2-3 people with 2 seats and a lounge and is surrounded by a privacy fence. The house was great for us over Easter weekend. We were really excited about how well equipped the house was. Extra toiletries, plenty of towels. The house was very cozy. The only issue we had was the hot tub apparently has issues (can't heat and bubble at the same time). Would definitely come back, nothing fancy but cozy and had what we needed. We had a wonderful time in the house. We would love to come again. Great place to stay post surfing! Very comfy and cozy. Just as advertised and perfect for our needs! Comfy, homey, clean, fully-appointed kitchen, sea air, Grandma's House stays on my list. Always great to stay at Grandmas. It’s our fourth year and my kids always look forward to the next one. Affordable and cozy has everything we need for some time away. Love how close it is to the beach and store. Bikes are awesome. Kids love that they can ride to the beach and all around. The little aquarium in Westport is run by a very enthusiastic and fun family. We highly recommend visiting. Much of the year there are tons of sea lions on the docks. Of course fishing, surfing and family time at the beach are the most popular activities our guests enjoy.